Create an audit policy watch rule. finding audit log linux file open / file open detect and modification / changes. Delete Audit policy using below command. Add default External Geway address (Optional). Create Shell scripts adding both IP address gateway for simultaneous access. Provide execute permission shell scripts. Add shell script file path into init.d network file for auto adds the default gateway. if any node restart. After successful Reboot the Linux system. It will accessible both IP address segments. Jun 17 03:51:44 eznag nagios: ndomod: Still unable to connect to data sink. 3585388 items lost, 5000 queued items to flush. Jun 17 03:52:00 eznag nagios: ndomod: Still unable to connect to data sink. 3585561 items lost, 5000 queued items to flush. Jun 17 03:52:16 eznag nagios: ndomod: Still unable to connect to data sink. 3585774 items lost, 5000 queued items to flush. Jun 17 03:52:32 eznag nagios: ndomod: Still unable to connect to data sink. 3585877 items lost, 5000 queued items to flush. Jun 17 03:52:48 eznag nagios: ndomod: Still unable to connect to data sink. 3585970 items lost, 5000 queued items to flush. Check logs, It will stop "Still unable to connect to data sink" error logs. Jun 23 16:31:43 eznag nagios: ndomod: Successfully connected to data sink. 8 queued items to flush. Jun 23 16:31:43 eznag nagios: ndomod: Successfully flushed 8 queued items to data sink. Jun 23 16:31:43 eznag nagios: Event broker module '/usr/local/nagios/bin/ndomod-3x.o' initialized successfully. Jun 23 16:31:43 eznag nagios: npcdmod: spool_dir = '/usr/local/nagios/var/spool/'. Jun 23 16:31:43 eznag nagios: npcdmod: perfdata file '/usr/local/nagios/var/perfdata.dump'. Jun 23 16:31:43 eznag nagios: npcdmod: Ready to run to have some fun! Jun 23 16:31:43 eznag nagios: Event broker module '/usr/local/nagios/lib/npcdmod.o' initialized successfully. If anybody facing issue blogger below error message. please implement the below steps in your blogger settings. Settings -> Publishing -> Blog Address -> Edit -> Simply enable checkbox Redirect warje.com to www.warje.com -> Click Save Option. The binary log is a set of files that contain information about data modifications made by the MySQL server. The log consists of a set of binary log files. The PURGE BINARY LOGS statement deletes all the binary log files listed in the log index file prior to the specified log file name or date. BINARY and MASTER are synonyms. Deleted log files also are removed from the list recorded in the index file, so that the given log file becomes the first in the list. How to Delete Binary Logs and Master Logs on Windows Platforms Steps. First Open MySQL admin command prompt. Type root id and root user password. 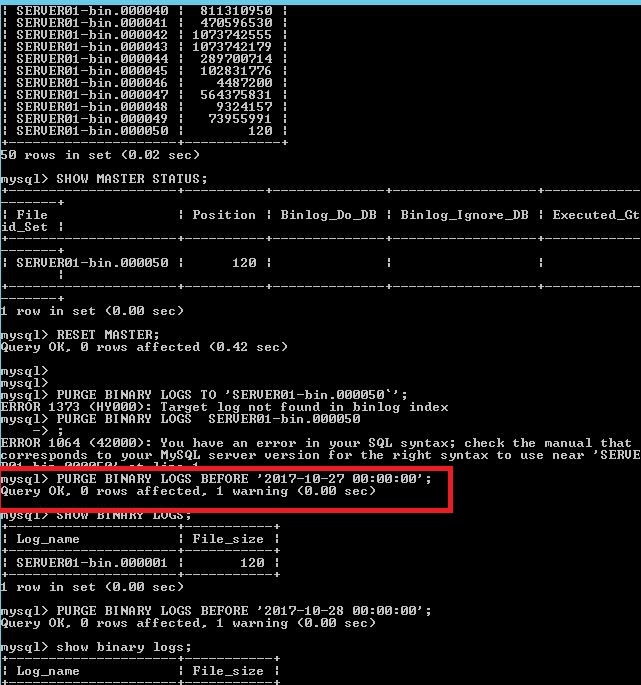 Show list of binary logs files on MySQL Server. 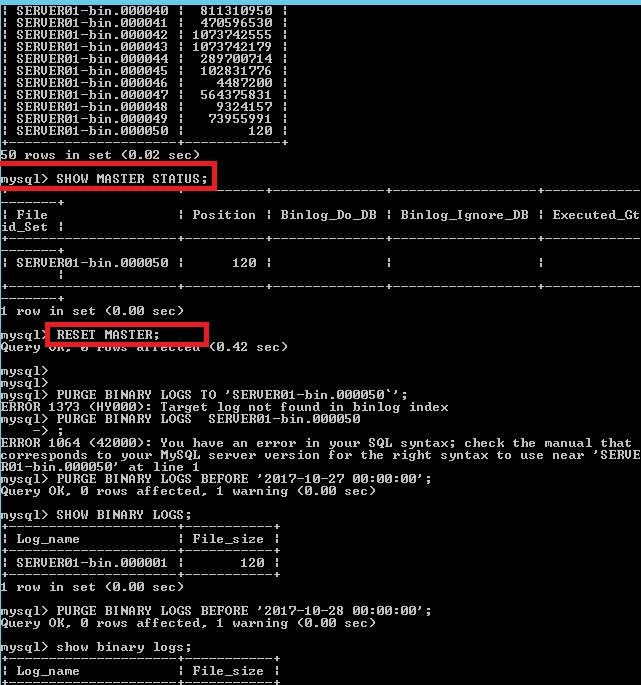 Display master logs file and Delete master log file using command marked Red color in a screenshot. 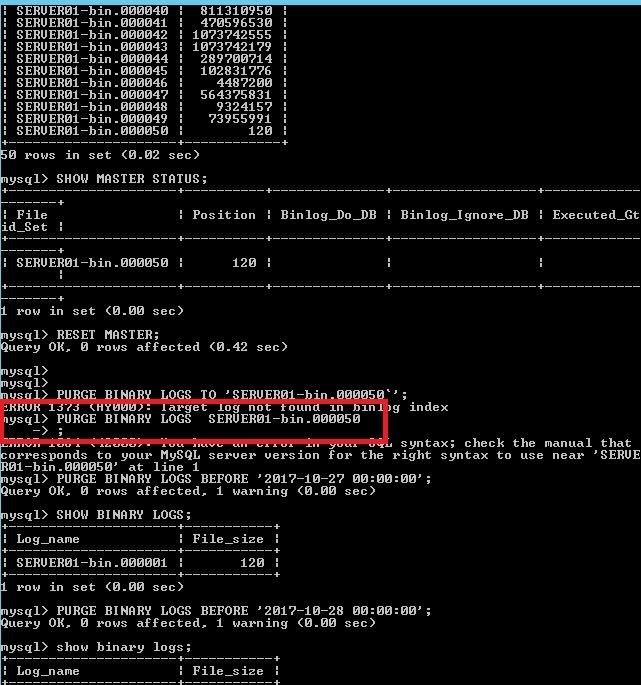 Delete single binary log file using command marked Red color in a screenshot. Delete all binary log file using command marked Red color in a screenshot. Specify the correct date which dates older files you want to delete. Show list of binary logs files on MySQL Server. Now showing only one, rest all deleted. Please Install Google Drive Backup and Sync on your computer. Download available below link. After installation, Please configure your First Google Drive account. For Second Google Drive account; Please create one New folder at any location on your windows 7/8/10 system/laptop. 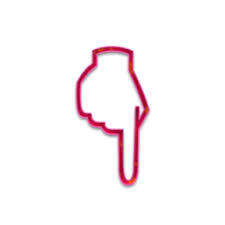 Create one new mohan.bat or XXXXXX.bat file and open in notepad , add below mention entry. mohan à Replace with your mail account name [Or] Other name which you like "My mail" or "My Inbox". Remaining scripts Don't change / Don't Remove any space between letter/words. (C:\Program Files (x86)\Google\Drive ) to New folder location which you created. Refer below screen shot. Simply open mohan.bat (XXXXX.bat) file. It will open new google drive backup and sync login windows (Reference below screen shot)..You can add another gmail account and configure it. After configure you can see Two Google Drive icon in task bar. New Google Drive Account Auto start option. Create shortcut using mohan.bat / XXXXX.bat file and cut, paste shortcut to windows startup location. After the reboot of system. Google drive second account will start automatically. If need more account to be configure. Please follow Step 2 to Step 5. Setup up Nagios to use an external SMTP server. 1. Download the SendEmail setup tar file from below link. [or ] Directly use wget command on Linux command prompt. For Testing run below command on Linux command prompt. You will get Test Mail. If receiving Test mail. Your external mail server installed successfully. Note:- Change below Parameters respectively to your mail config details. 5.Update below entry on contacts.cfg file. 6. Restart your Nagios service. Your done. Nagios will now send alert notifcations via your external SMTP server. If you want change nasios default /nagios context path to new context path. After that try below URL on any browser. First login CentOS Linux putty session. Run NTP update command using NTP Server or Google Server. You willl see NTP Socket is in use Error. Run below commands. NTP Command. Time updated successfully. If you want change IST time/date format,Try below commands. The RESTORE ... WITH RECOVERY option puts the database into a usable state, so users can access a restored database. This is likely caused by the restore script adding the WITH NO RECOVERY parameter to make the database ready for a transaction log apply after the restore. The database is now waiting for the latest transaction log file. Before you do this, please make sure you understand the implications of these options. You may cause data loss if you are not careful. Before starting, it is always good to backup the data, if something goes wrong. Easily restore from backup. To Reduce a logical volume / file system there are 5 steps needed to be done very carefully. While extending a volume we can extend it while the volume under mount status (online) but for reduce we must need to unmount the file system before reducing. unmount the file system for reducing. Check the file system after unmount. Reduce the Logical Volume size than Current size. Recheck the file system for error. Remount the file-system back to stage. Resizing the filesystem on /dev/mapper/vg_test01-lv_home to 65536000 (4k) blocks. The filesystem on /dev/mapper/vg_test01-lv_home is now 65536000 blocks long. Successfully reduced /home file system size. NTP (Network Time Protocol) is used to allow network devices to synchronize their clocks with a central source clock. For network devices like routers, switches or firewalls this is very important because we want to make sure that logging information and time stamps have the accurate time and date. *14:09:12.784 UTC Sun Mar 18 2016 --> Incorrect timezone. *15:12:59.784 UTC Sun Mar 20 2016 --> Still showing incorrect time and Clock unsynchronized. system poll interval is 8, never updated. Try below step by step commands. Synchronize using clock with the public NTP server. Above we see the show ntp associations command that tells us if our clock is synchronized or not. The ~ in front of the IP address tells us that we configured this server but we are not synchronized yet. You can see this because there is no * in front of the IP address and the “st” field (stratum) is currently 3. The router tells us that we are unsynchronized and that there is no reference clock. we will just wait a couple of minutes and take a look at these commands again. system poll interval is 64, last update was 28 sec ago. NTP Server time updated successfully. Click Windows Start Click "File Explorer " option - Click "View" option – Click "Options" and then "Change folder and search options"
Then click on “Clear” and OK to save your preferences.